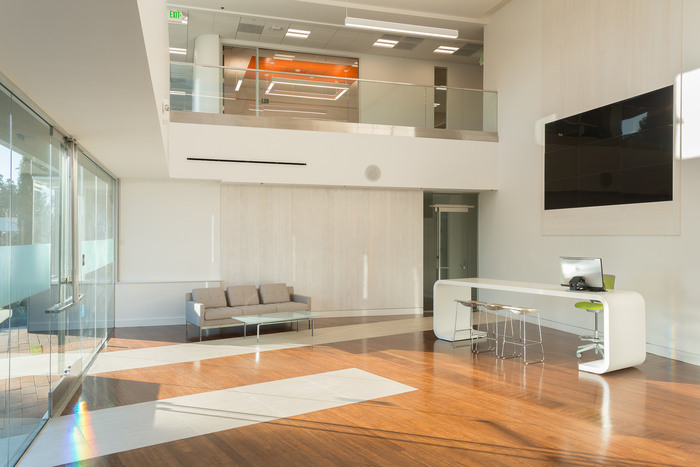 Modulus was tasked with the design of the offices for protein research company ProteinSimple, located in San Jose, California. ProteinSimple’s new home strategically responds to the creative minds that help thousands of researchers around the world resolve their protein analysis problems. The refined and warm approach, unique to a biomedical company, helps cultivate insightful advancements through simpler protein tools and allows the company to flourish in an environment crafted to their mission. Using the simplicity of the protein molecule itself, a rhythm and order was established that formed a coherent approach towards the spatial development of the interior. White washed accoya, caramelized bamboo, inlaid tile, indoor/outdoor pavers, and a custom designed thin profile reception stand complete the subtle statement of the lobby, tinged by colors drawn from the corporate identity.